gregmorriscards has no other items for sale. 1960'S 1970'S VINTAGE BASEBALL CARD LOT! MASSIVE ESTATE HUGE LOT! VINTAGE CARDS! 1933 Goudey #65 - MILTON GASTON / White Sox / EX-MT+ FIRM! / Nice Higher-Grade! 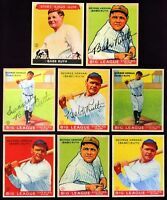 1933 33 Goudey Babe Ruth Card #53 Reprint. MINT. Pay a maximum of $3.00 shipping on all eligible items from gregmorriscards.